The city of Dallas, Texas TX, is often affectionately known by locals as the 'Big D' and is located in the northwestern part of the state. 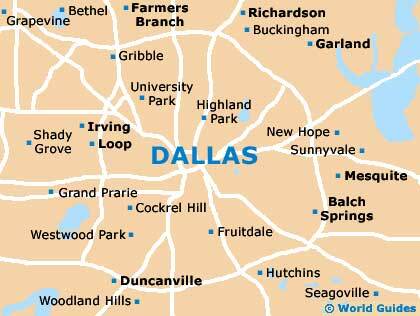 Dallas dates back to the 1840s, when it became a major financial center in this part of America. 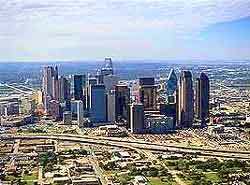 Made famous by the tragic assassination of President John F. Kennedy in the Dealey Plaza and the extremely popular 'Dallas' television show in the 1980s, the city is also known for its major sporting achievements by the Dallas Cowboys - who have won the Super Bowl several times. There is so much more to Dallas than just striking, mirrored-glass skyscrapers, business centers and banking, and the city has developed into a lively and exciting tourism destination, filled with tourist attractions, fine restaurants, impressive shopping centers, a thriving nightlife and many seasonal events, such as the annual Texas State Fair. Much of the sightseeing in the city is centered around the downtown area and the historical West End district. Located within the Old Red Courthouse is the helpful Dallas Convention and Visitors Bureau (CVB) Information Center on South Houston Street, close to the Dealey Plaza Park and the Texas School Book Depository. Tourist information is also available at the nearby Dallas Fort Worth International Airport (DFW), which lies to the northwest and within the boundaries of Coppell, Euless, Grapevine and also Irving. 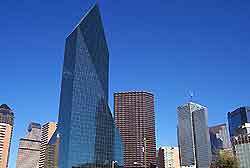 Dallas incorporates a number of surrounding areas and towns, including nearby Fort Worth, and features one of the largest selections of hotels in Texas (TX), USA. Hotels in Dallas are located throughout the downtown district, close to the Market Center and on the northerly side of the city, which is often particularly convenient for business travelers. There are also a number of accommodation options located within the Arts District, Deep Ellum, Greenville Avenue, the Swiss Avenue Historic District, University Park, Uptown and the West End. More information about Dallas Hotels. This famous Texan city has many world-class tourist attractions, including the American Airlines Center - an important sports and entertainment complex in downtown; the Dallas World Aquarium - featuring more than 85,000 gallons of salt water filled with sea creatures and marine life from all over the world; Dallas Zoo - home to one of America's best exhibits of African animals; Fair Park - a National Historic Landmark containing Art Deco buildings and amusement venues; the Dallas Arboretum and Botanical Gardens - beautifully landscaped gardens containing mature trees and plants; and the J. Erik Jonsson Central Public Library - standing in the Arts District, the city's main public library, containing a vast collection of books and local artifacts. Other popular tourist attractions in Dallas include the Bank of America Tower - the tallest building in the city, with 72 stories; the City Hall - a dominating building with a stylish water feature; the Old City Park - a charming historic village featuring authentic, restored buildings; the Old Red Courthouse - in downtown Dallas, one of the city's most famous landmarks, built in 1892 from red stunning sandstone; and the Reunion Tower - an instantly recognizable sight, with a distinctive dome and observation tower. 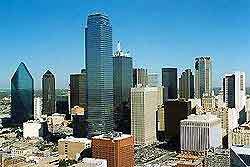 More information about Dallas Tourist Attractions and Dallas Landmarks. Tourist attractions located close to Dallas include the Forth Worth Gardens - a breathtaking 'urban gorge' that features waterfalls, cascading fountains and a sculpture garden; the Six Flags over Texas Amusement Park - a vast park, located in Arlingtion - midway between Dallas and Fort Worth; the Southfork Ranch - most famous for being the main film set of the legendary TV series 'Dallas'; and White Rock Lake - a popular weekend destination, ideal for running, cycling, hiking, birdwatching, fishing and boating. Dallas also features many top museums, such as the African American Museum - believed to house the best collection of African American art and folk culture in the southwest; the Age of Steam Railroad Museum - situated in the spreading Fair Park grounds just outside of the city environs; the Dallas Museum of Natural History - an impressive museum with extensive collections of dinosaurs, exhibits of animals, and rocks and minerals; the Sixth Floor Museum at Dealey Plaza - probably the most famous spot in the city, with information relating to the assassination of John F. Kennedy; the Dallas Museum of Art - the city's premier art museum, with a magnificent collection of African, American, European and Asian arts; the Kimbell Art Museum - containing art dating back to late antiquity, right up to the 20th century; and the Sir Richardson Collection of Western Art - attracting over 50,000 visitors each year. More information about Dallas Museums and Dallas Art Galleries.